Hong Kong, home to a huge array of cheap local restaurants, some of which, for some reason or another have gained themselves a Michelin star. One Dim Sum, Ho Hung Kee and Tim Ho Wan are a few of these. The question is are they worthy? Surely the fact that the Michelin guide is handing out stars so easily in Hong Kong diminishes the credibility of the guide? Yet the crowds still flock. And I still flock… to see what all the fuss is about. Today I visited Ho Hung Kee, a local noodle and congee shop awarded a star in 2011 few years ago based on the quality of the Beef Hor Fun (干炒牛河). The place is a no-frills, sharing table joint which has traded in the same location since 1946. 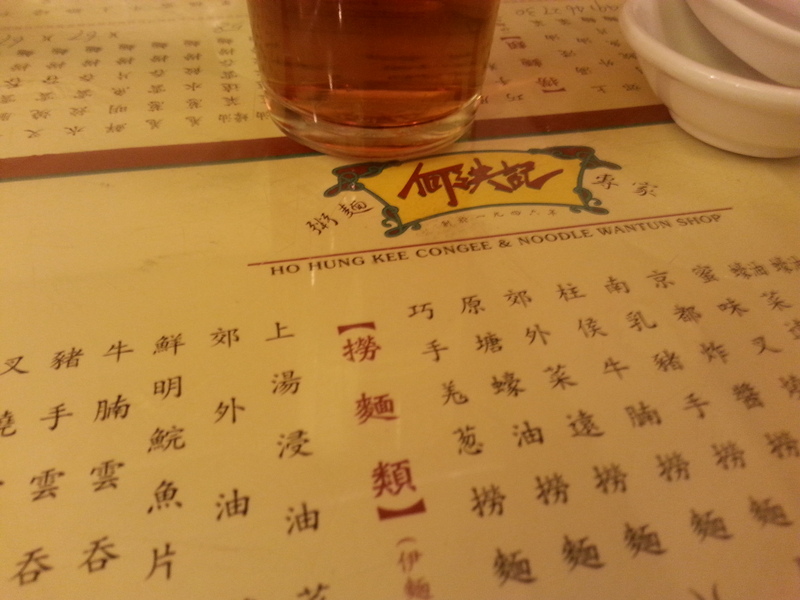 I ordered the Beef Hor fun (at a whopping $82 HKD). I had been told that the portions were rather small, so I was surprised when a fairly sizeable plate was served. 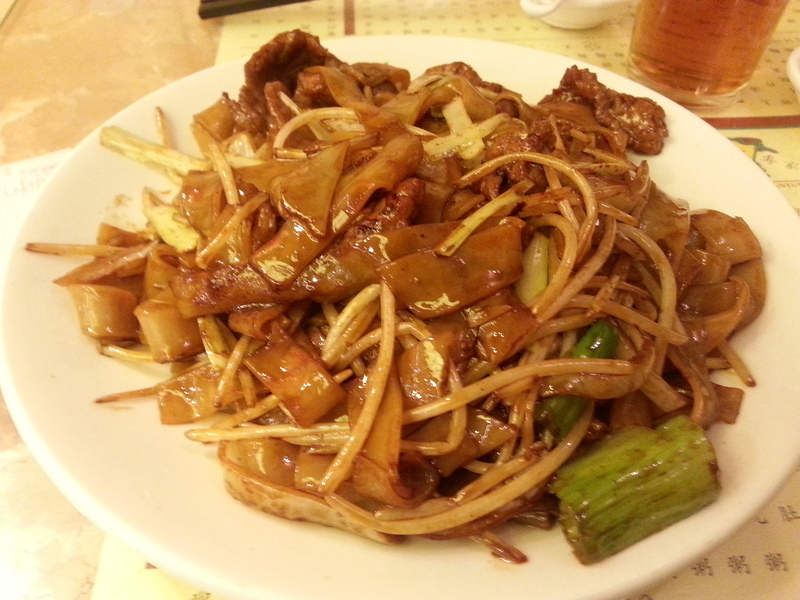 The noodles were smooth, firm and charred (wok hei) – though perhaps not as much as I would like. The beef was flavourful but had been tenderised, but not to the point where it no longer resembles beef. My major issue with the dish is the fact that it was absolutely swimming in oil. Don’t get me wrong, I understand how the dish is supposed to be cooked, but by the end of the plate, you can actually taste the oil with each bite. In my own opinion it was a decently executed plate of beef hor fun. Not bad, not great. Decent. And herein lies the problem. Today’s visit makes me wonder why the Michelin guide would dish out stars so freely. Good, local cheap eats are generally praised in their own light. Why put a put them head to head with high end Michelin restaurants who strive for across the board excellence? Local joints will never be able to ensure the consistency, service levels or ambience require to maintain a Michelin star. The other concern is that these establishments turn into a destination for food lovers seeking out ‘cheap michelin stars’ and subsequently prices (and wait times) are raised to match. Evidence to this is the fact that I paid a whopping $82 HKD for my beef hor fun and that the price has jumped up radically since the star was awarded. The rest of the menu is equally inflated – $40HKD for standard congee (congee at famed sang kee is still $20HKD as the regular patrons won’t pay more). Ho Hung Kee have recently opened a shiny new outlet in the new Hysan Place mall and will sadly close their original Sharp St location by the end of May. Should you go? Well that’s up to you, but it is worth a visit, so long as you don’t walk in with ‘michelin’ expectations. This entry was posted in Hong Kong, Hong Kong restaurants and tagged Congee, dim sum, HongKong, Hysan Place, Michelin, Michelin Guide, noodles. Bookmark the permalink.